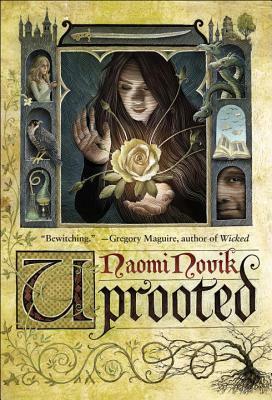 I originally dismissed Uprooted as being a Middle Grade novel--something about its cover reminded me of Frances Hardinge--and, not being a reader who gravitates towards the MG genre, I didn't bother to even read its synopsis. Big. Mistake. Luckily for me, Uprooted began showing up on my newsfeed constantly. So often, in fact, that I finally scourged through all its reviews, read its synopsis, and proceeded to get my hands on it immediately. Though it has been compared to "Beauty & the Beast," its similarities to the fairy tale begin and end with a young girl being whisked away to live in a tower with a "beast" of a man who converses with none and harbors secrets of his own. Uprooted takes off on its own after that initial set-up, deviated almost entirely from the fable we know and becoming a magical tale in its own right. If I had to compare it to any novel, I'd compare it more to A Court of Thorns and Roses, which also released around the same time. Maas's novel and Novik's both feature strong protagonists who are imprisoned by a "beast" only to find themselves willing to help this "beast" in overcoming the struggles that plague him. Maas's novel is far more deeply entrenched in the New Adult genre--romance-centric with hints of erotica--while Novik's is a fantasy novel, through-and-through. Needless to say, I've enjoyed Novik's far more than I expected to and cannot recommend this gem of a stand-alone story enough. Agnieszka, the protagonist of our tale, is a wisp of a girl. Not only is she prone to losing items and has a knack for dirtying her clothes, she is as unexceptional as they come. Kasia, her best friend, is her exact opposite: beautiful, talented, and capable. Thus, the entire village expects that the Dragon, the wizard who guards their lands, will take Kasia to his tower. Every ten years, the Dragon selects a girl from the village to live with him for a decade. For ten years these girls live, away from their families and loved ones, serving him dutifully until he releases them with a sack of money and beautiful, gold-spun dresses. He's a fair and capable lord but his unwillingness to interact with the villagers--and the fact that he will likely take Kasia away--makes Agnieszka resent him. When the Dragon selects Agnieszka instead of Kasia, she--and those around her--are all astonished. It quickly becomes evident, however, that Agnieszka is a witch. By law, the Dragon is compelled to take her on as an apprentice and train her in magic. As Agnieszka struggles to learn, however, dangerous evils are brewing. The Wood, the dark forest in which people disappear, is stirring and the royal family grows restless at the fact that their Queen, who vanished into the wood twenty years ago, has still not been found. Novik expertly weaves fantasy alongside political intrigue and deep, meaningful relationships to present Uprooted. Trust me, once you sink your teeth into this world, the last thing you'll actually want is to be uprooted at all. One of my favorite aspects of this novel is the friendship between Agnieszka and Kasia. Kasia has been preparing all her life to be chosen by the Dragon and when she is left behind, neither she nor her mother know what to think. Similarly, Agnieszka, despite hating the fact that her best friend would be snatched away from her, could not help but be relieved that she would not be chosen by the Dragon herself. With their roles reversed, however, I thoroughly enjoyed watching as both Agnieszka and Kasia grew on their owns, facing the strange twists of fate that life threw at them. More than that, though, I appreciated the manner in which their friendship changed with time and circumstance. As a student fresh out of her first-year of college, I connected with their honest--and often tumultuous--relationship. I love nothing more than when fantasy incorporates realistic elements in a make-believe world and Novik does it better than I've seen in awhile. Nevertheless, I practically squealed when I realized how politically driven this novel was. Uprooted contains an intriguing plot, one that is best experienced blind, but the magical and royal politics of this realm are not only fleshed-out, they are manageable in this stand-alone volume. Moreover, they contribute to the stellar world-building and through the political sphere, the villain of this novel becomes all the more evil. I'm glad I didn't read this at night because--believe me--the Wood is terrifying. It's hard, these days, to create a believable evil but Novik manages it--just as she manages nearly everything else in this novel--to perfection. The only aspect of this novel that I found (sliiiightly) lacking was the romance. I adored it. Agnieszka and the Dragon are a pair of complements. Though they seem unlikely at first, what with her being held prisoner by him, as Agnieszka grows and gains more agency, so too does she attain more equal ground with the Dragon. Novik paces their romance well and the growth of their feelings for one another feels authentic. I only wish, though, that we could have seen more of their interactions in the latter-half of the novel. Agnieszka and the Dragon are not together throughout the novel and though that aids the plot greatly, I also wished for more of them together. And, in particular, I wanted to learn more about the Dragon. Agnieszka I feel as if I know completely--her voice is friendly, her mannerisms adorable, and her strength admirable--but the Dragon is still an enigma, in many ways. Nevertheless, I swooned and sighed and, at the end of the day, I can't ask for much more. If it isn't already clear, Uprooted is a must-read for fantasy lovers. It's beautifully written, scripted to perfection, and unique in the sense that it reads like lore--like a Marillier novel--despite being much more far-reaching than her Sevenwaters tales tend to be. For a fantasy-loving, political-plot-adoring, romance-swooning, stand-alone-admiring reader like me, Uprooted was a couple hours of sheer joy. I loved your review so so much!! YOUR REVIEW. EEEP. I went from having never heard this book to I NEED THIS BOOK LIKE YESTERDAY. Funny thing, I'm actually currently reading ACOTAR, and I'm really liking it, so I think I would enjoy Uprooted as well!! I'm drawn to the fact that the author does this fantasy world really nicely; it seems like all aspects are fleshed out fully. I love seeing relatable "our world" connections to fantasies too, it just makes it much more likable! SO glad you loved this one, I'll have to read it ASAP and give creds to you if I end up loving it! Beautiful review as always, Keertana! The cover to this book is so misleading. At first I Uprooted as being a Middle Grade novel too. But now I’m dying to have it in my hands, especially after your reference to Marillier. Wonderful review, Keertana! Well, all right then. Consider me completely convinced. Yours was pretty much the last opinion I needed and the one that finally convinced me that I need to buy a copy asap. I shy away from retellings, which is why I've waited so long, but now that I know that the story has a life of its own, there's really no reason to wait. Gorgeous review, Keertana! Ah yes I saw this book twice on some blogs and the reviews were quite good as well so I'm glad to see you had a great time with it as well. I want to try! Oh I love retellings! I love Beauty and the Best retellings but I'm more happy that it has seemed to be a tale of it's own. These are the books that prevent me from totally dismissing MG books! I think I need to read it! I can't believe I still haven't read this one yet. All of my friends (and I mean all of them) have loved this book, and it's been sitting on my Kindle for weeks. July should be a slow month for me, so I'm hoping to get to it at least by then. I have a book to read now so I will catch up with you later. It's funny because just today, someone reminded me how much I need to read the book and since I already have it, I am tempted to start right now. As a fantasy lover and someone who's favorite re-telling to read is beauty and the beast, this book and I were meant to be. I just hope I end up loving it as much as you did, Keertana! Admittedly, I am a little sad that you found the romance lacking because one of my favorite things is watching couples interact and the fantastic dynamic between them but I think I'll live. I've heard SUCH good things about it and I'm so glad you loved it! I have to pick it up soon!